The National Day of Prayer is Thursday, and we can anticipate protests over prayer having a role in the official life of government. But this is nothing new. In fact, this is the very manner in which our nation began. When the Continental Congress came to Philadelphia for the first time in September 1774, they wondered how they should begin. Gathering at Carpenters Hall, someone proposed they begin with prayer. This was opposed, and a debate ensued. The disagreement was not over prayer to God but prayer with one another. Quakers, Congregationalists, Anglicans, Presbyterians and so on never prayed together. Each believed the other was flawed in faith and so prayer in common bordered on sin rather than worship. The impasse was broken when the revolutionary firebrand, Sam Adams, declared, "I am no bigot. I can pray with any man who loves his God and loves his country." He identified just such a man at Anglican Christ Church and called for prayer to be led by the Rev. Jacob Duche. Adams' motion was daring and decisive. Adams came from the Congregational tradition that had beheaded the head of the Anglican Church, King Charles I, and yet he called for an Anglican minister to lead in prayer for the movement that he was staking his life on creating. The motion carried. Duche arrived a few days later to solemnize the congress with a prayer that included the words, "Our Lord ... look down in mercy ... upon these American States. ... Direct the Council of the honorable Assembly. ... Shower down upon them, and the millions they here represent, such temporal blessings as Thou seeist expedient ... and crown them with everlasting glory in the world to come. All this we ask in the name and through the merits of Jesus Christ, Thy Son, our Savior. Amen." In 1875, the Library of Congress described this first prayer of the Continental Congress: "Washington was ... there, and ... the Puritan Patriots of New England. ... 'It was enough' says Mr. [John] Adams, 'to melt a heart of stone. I saw the tears gush into the eyes of the old, grave, Pacific Quakers of Philadelphia.' 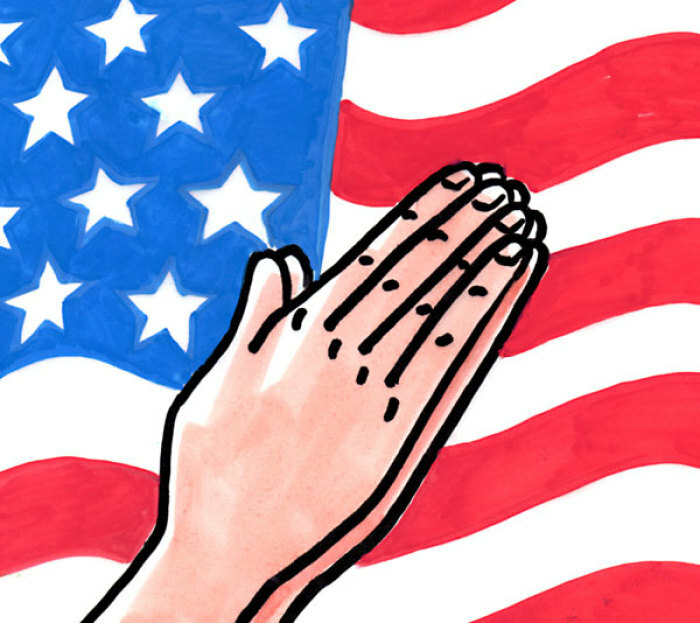 "
Ever since, prayer has played a role in the nation's life. The Continental Congress had days of prayer and fasting and days of Thanksgiving. The Founders' Thanksgiving Proclamation in 1777 asked "that with one heart and one voice the good people may express the grateful feelings of their hearts ... and that together ... they may join the penitent confession of their manifold sins ... that it may please God, through the merits of Jesus Christ, mercifully to forgive and blot them out of remembrance; that it may please him graciously to afford his blessing on the governments of these states. ...'"
In the midst of the Civil War, Republican Abraham Lincoln joined Congress in calling for a day of prayer and fasting. He declared, "Intoxicated with unbroken success, we have become too self-sufficient to feel the necessity of redeeming and preserving grace, too proud to pray to the God that made us!" Democrat Franklin D. Roosevelt led the nation in prayer on the eve of Election Day 1944: "Almighty God ... We commend to Thy overruling providence the men and women of our forces. ... Enable us to guard for the least among us the freedom we covet for ourselves .... May the blessing of God Almighty rest upon this whole land; may He give us light to guide us, courage to support us, charity to unite us, now and forevermore. Amen." In spite of the ongoing debate over prayer, I pray that God would answer the prayers that have risen throughout our storied history and will again arise from America's leaders on our National Day of Prayer. Amen. Dr. Peter A. Lillback is the president of The Providence Forum, an organization devoted to recognizing the role of faith and providence in the story of America.